The Renault Ez-Ultimo brings the high-end glitz to the show this year. Just because cities of the future may prioritize ride sharing over private cars doesn’t mean you should have to slum it on the way to opening night at the Opéra national de Paris. This rounded bronze box is about as far from a production car as a concept can be (could those wheels even turn? where’s the ground clearance for cobbled streets?) 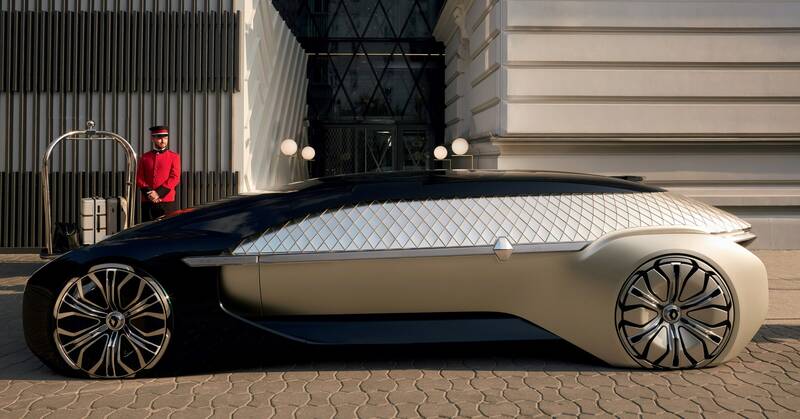 but Renault says it shows a vision of an autonomous future, where passengers demand more from vehicles. In particular, the interior “reflects French elegance” with wood, leather, and marble. Citroën went the opposite direction, unveiling a very real, very modest EV. The DS3 Crossback E-Tense is a fashionable crossover SUV, and an update on Citroen’s tres popular DS3 supermini car. The electric version comes with a 50-kWh battery—about half that of a high-end Tesla—a range of 186 miles on the generous European test cycle, and a 0-60 time of 8.7 seconds. None of those specs are going to blow buyers away, but at the right (to be revealed) price, the quirky car, with sharp angles and odd window cutouts, could rival the Nissan Leaf or Renault Zoe, as a city runabout. Europe has taken styling cues from the US for the Peugeot E-Legend concept, albeit with a little added flair. There are plenty of muscle car hints in the styling, with a side profile reminiscent of the modern Dodge Challenger, and a Mustang-like front squint. Of course it’s a concept, so it’s electric and autonomous, and supposed to show that those things don’t have to be boring or bland. The retro theme continues inside with velvet upholstery and fake wood screensavers for the displays when they aren’t in use. It’ll apparently have a 100-kWh battery pack and all-wheel drive, but it’s so concept-y that wise money should be on all that potentially changing, if and when the E-Legend makes it to production. Smart has already stopped the sales of all internal combustion engined cars in the US, and if this car makes it across the Atlantic (and to reality) it could find a place in some Californian garages. The Golden State has good EV electric rebates, and as close to a guarantee of good weather as you’re going to find. Infiniti is keeping it real with its Project Black S hybrid, based on a Q60 coupe and its V6 engine. Infiniti engineers turned to electrification, and lessons from partner Renault’s Formula 1 team (there’s the French connection) to give the machine an e-boost. It’s a hybrid, but one that delivers performance rather than economy. The three motors add 213 horsepower to bring the total to 563, and drop the 0-60 mph time to under four seconds. Toyota didn’t use the Paris show to unveil radical new concepts, but did introduce a term that will be new to most buyers: self-charging hybrids. This is no magical perpetual motion-type technology: Self-charging hybrids are just cars that can run on battery power, but can’t be plugged in. The type Toyota has been selling for years with the Prius, when they used to be just called “hybrids.” As they’ve gone from being radical, to commonplace, to somewhat lame given the influx of more robust electric options, Toyota is looking to rebrand to remind people that the tech is still quite clever, and does save fuel.